The Sanlorenzo '82 is one of the newcomers that the Ameglia (SP) based yard will introduce at the next Genoa International Boat Show. It's about a classic - designed motoryacht, however, a protagonist of a restyling process that the Sanlorenzo Yard is just making under the supervision of Giovanni Janetti and in collaboration with both architects Della Rolla to its new motor yachts' series including units from 62 to 102 feet in length. Despite a need at renewing its motor yachts' external lines, the Sanlorenzo Yard has kept steady the styling concept that has made it famous up until now. This restyling process has been carried out to both exterior featuring now slenderer shapes and absolutely new - designed glued glasses and interior that has benefit of new furniture's drawings made for satisfying all present owners' requirements. The sleeping area along the lower deck is available in two layouts: one with a VIP amidships while the other offers the VIP forwards in the bow. 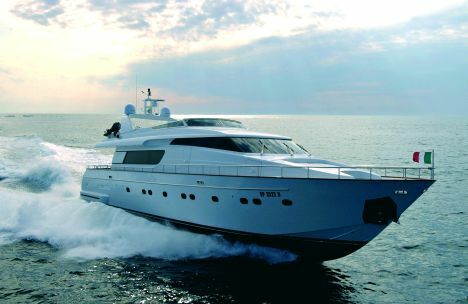 The Sanlorenzo '82's standard version features a full - beamed owner's suite amidships complemented with a wide office, relax area, dressing room and bathroom; going forwards this fine - looking yacht offers a VIP and two guest cabins with in - line twin beds each with its private bathroom, of course. At the fore end is situated the three crew member's quarter with private access from the main deck. Inside superstructures the wheel house in the bow is useable also as nav - station. 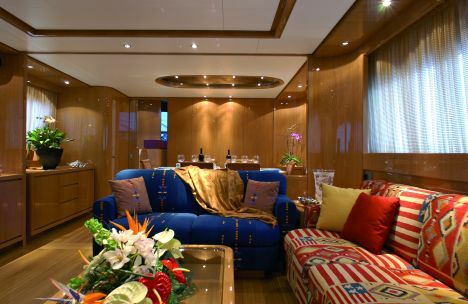 Going abaft we find a huge galley fitted up with Schiffini furniture, a recurring characteristic on Sanlorenzo's yachts, a dinning area for eight people and a saloon, while in the cockpit there is a dinette made for eating in open air. Her generally huge dimensions has made for a positive influence on all areas on the fly bridge that features, apart from the external wheel house, a sunbathing area, a dinette with wet bar and an empty transom area made for hoisting a tender. For further information please contact: Sanlorenzo, I - 19031 Ameglia (SP), Via Armezzone 3; Phone: +39 (0)187 6181; Fax: +39 (0)187 618316.